Welcome to the first installment of DIY Thursdays over here. I was talking to a friend in the mothers lounge at church a couple weeks ago... you know, where all life changing, prophetic conversations are had... We were talking about how on Pinterest you see all of these DIY projects, but they always wind up being super hard, or you spend way more on all the supplies than the person said you would. It's pretty much the worst. So each week, all of my projects are going to be $15 and under, and that's if you had to go out and by every single piece of equipment needed to make said item. With the exception of a hot glue gun, or a hammer, or toolish items like that... if we ever get to things like that. Today's project is a super easy, super cheap infinity scarf. 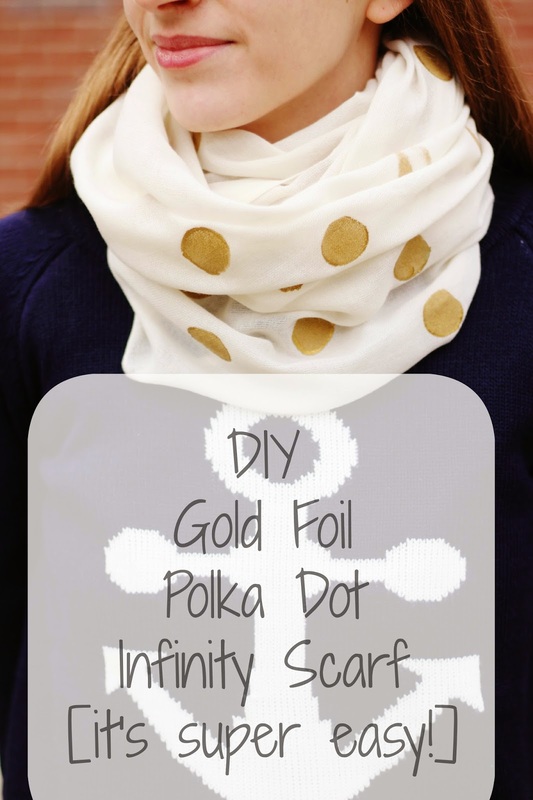 All you need to buy for this project is gold paint ($1.98 @ Walmart), and a white infinity scarf ($5 @ Walmart). I was surprised at how simple this was, and that I, being as uncrafty as I am, was able to pull it off! Scrap paper, old cardboard, old cereal box, something that you don't mind paint getting on. Start off by lining the inside of your infinity scarf with old cardboard, parchment paper, computer paper, whatever paper you have that you don't mind paint getting on. Paint will seep through your scarf and you don't want it getting on other side of your scarf, or your table. Don't use paper with print on it though, you don't want the print transferring to your scarf. Then start off by pouring paint into a bowl you don't care about. If using a non-disposable bowl, it will wash out as long as you rinse it as soon as you're done before it dries. Dip the lid to the paint, in the paint. A peak like this will form on the lid once you take it out of the paint. Simply wipe it off with your finger... leaving paint on the lid still, but just enough to take the peak off. You should then have one smooth layer of paint on the lid. Then simply press it into the scarf. I had to re-dip, and wipe for each dot, it went pretty fast though! I did an alternating patter on mine of 7 dots on one line, and then 6 dots on the next line. The dots were all windowed from each other so you didn't have a million dots all lined up in perfect straight rows. When you get done with the first side of your scarf, let it dry for a couple hours and then flip it over to the other side, and do the dots on the backside. Then let it dry again for another couple hours, and you have one incredibly cute scarf! Are there any particular projects you would like to see? Let me know in the comments below! Such an easy DIY and I love the way it turned out! So cute! Love that you used the top of the paint lid to create the polka dots! This is awesome!! I have to make it but I'd use blue instead of gold. Oh my! This is an awesome DIY. I would absolutely try it in my plain boring scarves. Thanks girl!